The evolution of Medina College, its begging and is one veritable evidence of the immense kindness and generosity of its founders, Dr. Rico M. Medina Sr. and Dr. Beatriz C. Medina. Motivated by a strong desire to enhance Healthcare Delivery on June 1963, Dr. Rico and Beatriz Medina founded Medina School of Midwifery in Annex, Ozamiz City, the first ever private school of Midwifery in this part of the country. Through gainful insight and hardwork, with discipline, patience and perseverance, the school grew and expanded to such unprecedented. So much so that in 1975 before the watchful eyes of the residents of Ozamiz City, Medina School of Midwifery opened its door to applicants for the College of Nursing. Shortly thereafter to cater to the needs of local residents and neighboring areas, more course were opened and offered and the name Medina School of Midwifery was changed to Medina College. As such, the growing population necessitated the construction of a big, two-storey concrete building in Maningcol, Ozamiz City. The name of Medina College has reached the ears of our people in the Northern part of Misamis Occidental. Thus, in 1984 in answer to public clamor for an educational institution for the under privileged but interested and deserving students, Drs. Rico and Beatriz Medina established the Medina Foundation College in Sapang Dalaga. Furthermore, a growing demand for a Nursing School in the Southern part was also seen. 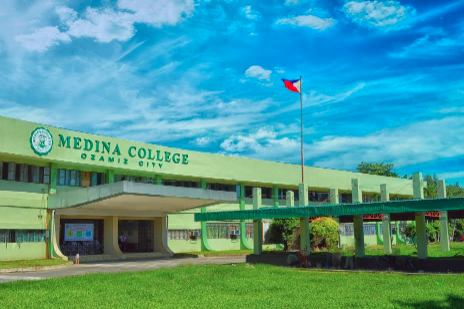 Henceforth, in June 1999 Medina College expanded and established the Medina College Pagadian. Today, Medina College continues to stand as a beacon of light swaying its banner, inspiring everyone to pursue excellent professional education.